This is my latest piece, a Sandworm from Dune. The picture comes from Jock’s concept art for the Peter Berg’s Dune. 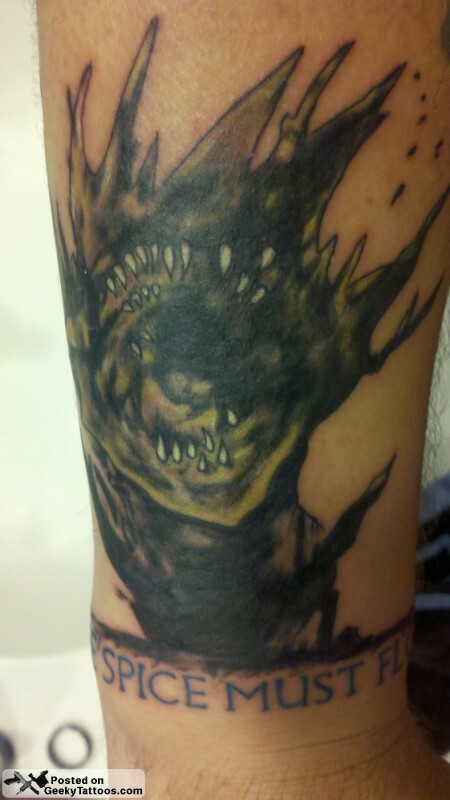 My right forearm is all Hunter S Thompson/Ralph Steadman anyways so I thought the artwork worked nicely in that area. My right forearm is my literary arm which in the future will include a Heron Mark, Crysknife, and something from Fight Club. This beautiful piece was done by Joey at Bombshell Tattoo in Houston, TX. This brings my “geek” tattoo collection to 9 pieces. 2 Hunter S Thompson, 2 Twin Peaks, Batman, Ghost Rider, the sword hilt for the King of Rohan and the Supernatural protection chest tattoo…which I got to please the wife. Posted in Books, Movies, Tattoos. Tagged with Bombshell Tattoo, Dune, forearm, sandworm.